The prow centre line seam. I am trying to restore an old Mirror and I am finding it very difficult to find info online about how to seal the seams between the plywood construction. The boat was originally sealed with fibreglass and resin along the seams, unfortunately that has trapped water and caused rot. 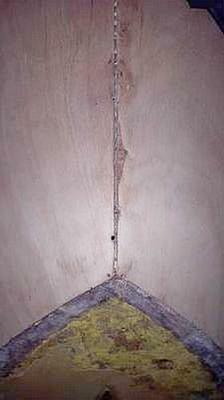 There is still resin in the seam although because it is old and brittle it has cracked and is leaking. I am hoping to be able to get it out. I am looking for a (hopefully cheap) alternative to seal the seams. The simplest and best way would be to fill any voids with thickened epoxy, then cover the seam with resin and glass tape. The plywood must be perfectly dry first.